Collections help you organise and manage your Alfred snippets; Group them by type or purpose, making it easier to split your work snippets from your emoji collection, for example. Create a new collection by click the [+] symbol at the bottom of the Collection column; Set a collection name and, optionally, an icon that will help you recognise the snippets when popping up the Snippets Viewer. To edit a collection, right-click the one you want to edit and choose "Edit..." or simply double-click the collection name. In Alfred 3.4, we've added the ability to set a collection-wide affix; This is a prefix at the beginning and/or a suffix at the end of any keyword in this collection. If you want to share a collection with fellow Alfred users or back up your own collection, right-click the collection title and choose "Export...". 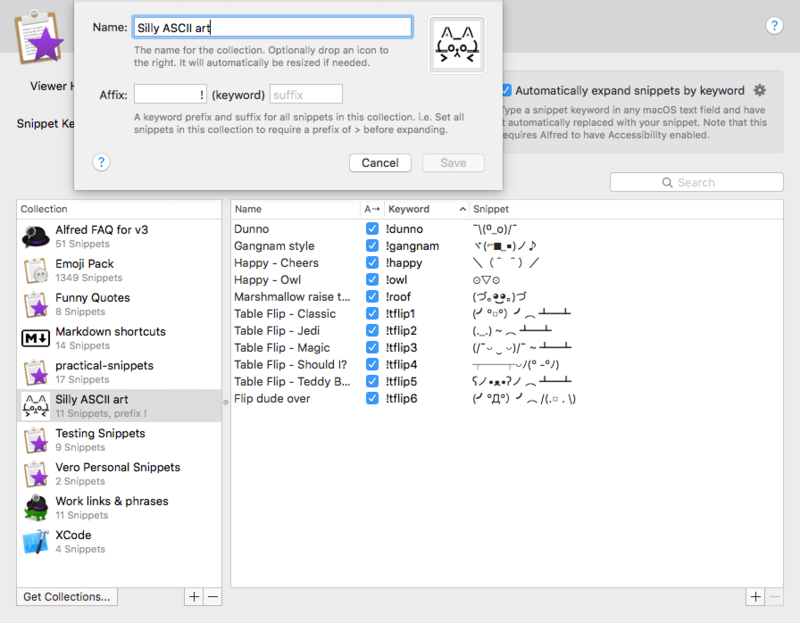 Any other Alfred 3 user will then be able to import your snippet collection and save time too! Pop by the Snippets feature page to find out more about using snippets and text expansion, as well as Dynamic Placeholders to add dynamically-changing content to your snippets.